I have always wanted to dive into C++ world (as a rather lazy kind never did). This is my another attempt. Since FF version of Ubuntu was released few days ago, almost every day I find something new and interesting. As I’m forced to write sometimes a very small C++ application (university commitments) and a couple of months ago I have realized that Sun Studio 11 is freely available, I wanted to give it a try. Unfortunately never did, that’s because somehow I couldn’t run it under Ubuntu (sometimes you have to choose, comparing the amount of work you have to do to actually make it work or the amount of work to write the program in VIM and forget about all the gui fancy staff). Anyway FF is available and suprise, suprise, Studio 11 works almost out of the box. Here you go simple step by step guide to install this “little” precious. 1. Install Java SDK and JRE 5, for some reason SS11 doesn’t work with version 6, you can however still keep the version 6 as the default one on the system. 6. Don’t worry if sdk 1.4 was not installed. and run the command sunstudio as normal. Does the Forte compiler gets installed by default with SS11? 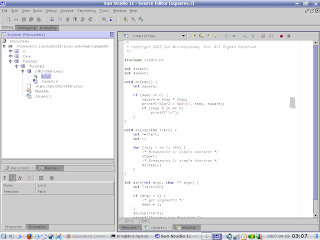 As far as I know,on Linux, Sun Studio 11 uses the compiler installed on your system, if you want to use the sun c/c++/fortran compilers with Studio 11 maybe you would have to consider moving to Solaris/OpenSolaris platform. Thanks a lot, I am new to linus and was trying desperately to use SunStudio. Your guide works perfectly, just remember to install “rpm”. with MUCH MUCH improved IDE. yeah! I saw it today morning, it’s based on Netbeans 5.5.1. Currently I have some problems with downloading the package installer but as soon as I get some luck I will post some feedback, Thanks!